Online documentation, tutorials, and client resources cover many shopping cart program features. For assistance or to leave a message go to the technical support or contact us page. Step by step instructions that will help you get your AShop up and running quickly even if you have little or no experience in installing web applications. Pre-Installation Test - Must be run before installing AShop X! Permanent license key fees are not refundable!! Please try before you buy! Before purchasing a permanent registration key and attempting to install the program, first run the pre-installation test. This script will report if your server supports all of the software requirements and automatically install the correct IonCube loader for the version of PHP that is running on your server. Instructions are included in the pre-installation test package. After passing the pre-installation test, install AShop X register it with a free 30-day trial key, which may be generated and used once for a domain. When you are sure that the program will suite your needs, then buy the permanent key and replace the trial key with it in order to continue using the same shopping cart installation. To replace the key, call the admin/register.php script from a browser. ie: http://www.yourdomain.com/admin/register.php. Permanent registration keys may be purchased through our online catalogue. Installation instructions are in the online help. 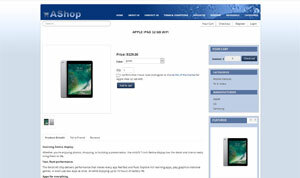 AShop X business and shopping cart software runs on most UNIX, Linux, FreeBSD, NetBSD and Windows operating systems that support the program requirements. This is a fully functional, complete new installation package. It can be installed and used with a free trial key for 30 days and then a permanent key may be purchased and installed if the program suites your needs. Please try before you buy! 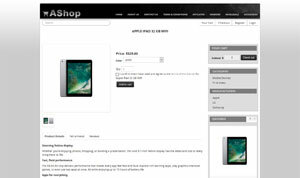 The manual for AShop is available both online from the Help icon in your admin panel and as a downloadable PDF document. Right click and choose "Save as" to save the document to your hard drive. This printable PDF document contains all the information you need to design your own themes or templates for AShop. 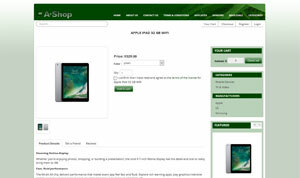 A must have guide for AShop owners who wish to customize the look of their shopping cart, web designers who want to sell custom designed AShop sites to their clients or create and sell commercial templates for the software. Right click and choose "Save as" to save the document to your hard drive. Design themes can be used to quickly give your AShop a brand new look. Just unzip, upload the contained folder to "themes" and select the new theme on the page Configuration->Layout in your admin panel. A red variation of the default AShop theme. Why not celebrate the Holidays with a Christmas theme for your shop? A black variation of the default AShop theme. This was previously the default theme. A blue variation of the default AShop theme. Language sets are free to use with AShop X. Each language set includes a set of language files, button images, and a receipt template. When more than one language set is installed, customers and affiliates may select their language preference. Not all themes support all languages, but you are welcome to modify and add language files as needed. Language files and themes are all open source files.